Check out the latest launching of Buffet 101’s FAMILY NIGHT OUT PROMO for 2015. This buffet promo sale happens at Glorietta 2 branch located at 3rd floor glorietta 2 Ayala Center Makati City. Enjoy your time of great food and drinks at an all you can buffet feast. 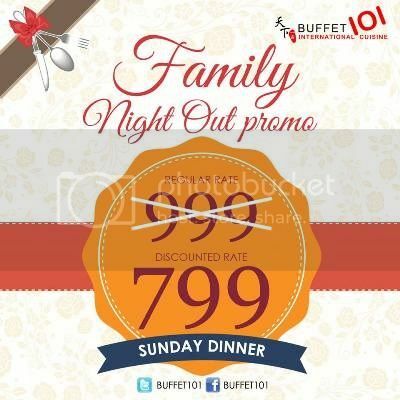 – This family Night out Promo available at Buffet101 Glorietta ONLY. – Enjoy a sumptous Sunday Dinner buffet for only P799 instead of P999. – This buffet 101 promo is valid during SUNDAY DINNER from 5:00pm-10:00pm. – Promo applies on a per PAX basis. – Promo NOT available on Special/Legal Holidays such as Valentine’s Day, Fathers and Mothers Day. Take note. This Buffet 101 promo can’t be used in conjunction with other in house promotions and discounts. This Buffet 101 Family Night Out 2015 Promo happens from February 8 up to March 29, 2015.